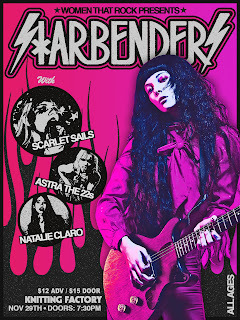 Women That Rock, a music discovery platform dedicated to promoting & supporting amazing women in music, is hosting a special concert event Thursday November 29th at Knitting Factory Brooklyn featuring an incredible lineup of femme-fronted bands: headlining group Starbenders alongside Scarlet Sails, Astra the 22s and opener Natalie Claro. The evening will be MC’ed by popular New York-based artist Ess See. incredible artist lineup, guests will enjoy a Women That Rock photo booth experience, Brooklyn-based femme vendors, a glitter bar, sparkly mini cupcakes, raffles and more starry surprises! The event is being sponsored by LIT Cosmetics, Kate’s Magik, Rudy's Music & Billy’s Bakery. 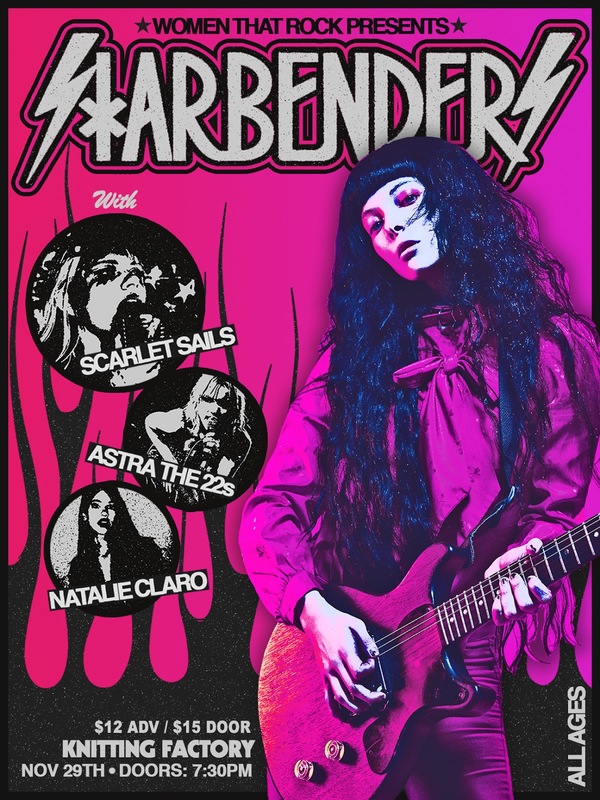 Hailing from Atlanta, headlining act Starbenders are the half way home for misunderstood misfits, fringers and glam punks. Front-woman Kimi Shelter and her gang have concocted a perfect alchemic blend of androgynous rock and roll power with "stuck in your brain" pop melodies. 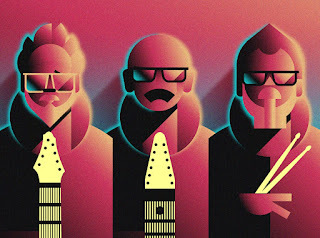 Women That Rock is thrilled to have the band on their star-studded Knitting Factory bill. Tickets can also be purchased at the door for $15. Doors open at 7:30pm. Women That Rock's mission is to spotlight & celebrate talented, badass female musicians! Women That Rock hosts daily artist/music features through its Instagram platform at @womenthatrock, plus monthly collaborative articles with women's lifestyle mag Harness Magazine, and a website at www.womenthatrock.co! In addition to its fast-growing digital platform, Women That Rock is in the live event space - putting on showcases, concerts and other related music events. Women That Rock’s inaugural showcase was held at the Knitting Factory Brooklyn in April 2018; The show featured performances by 4 female-fronted bands and a female DJ, and was sponsored by Guitar Center, Chipotle, Harness Magazine, BITE Beauty & Billy's Bakery. Since then, Women That Rock has hosted 1-3 events a month, including a special NYC PRIDE event at Coney Island Baby in collaboration with Jess Louise Dye (lead singer of popular Brooklyn band High Waisted), a summer showcase at Brooklyn Bazaar featuring GYMSHORTS, Sharkmuffin, MONTE, Lady Bits & Sister Munch, a concert at El Cortez with performances by buzzing bands Groupie, QWAM, Planet What & Lola Pistola, and a femme-fronted showcase in Burlington, Vermont at Foam Brewers with Clever Girls, MONTE and Father Figuer. Most recently, Women That Rock celebrated Halloween 2018 with a spook-tacular concert event at Brooklyn Bazaar featuring co-headliners Mrs. Smith and Ruby The Hatchet alongside MONTE, Clever Girls, Fern Mayo & The Values. 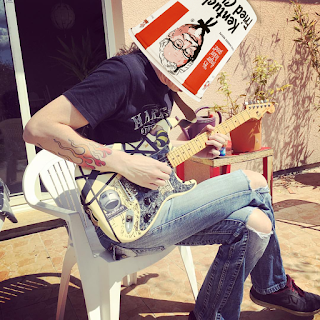 The event was sponsored by Fender, Austin Eastciders and Guitar Center.